When our technicians show up at your residence, we’re always sure have all the supplies we need on hand. Generally speaking, the pool owner should have telescopic pole, that we’ll use. 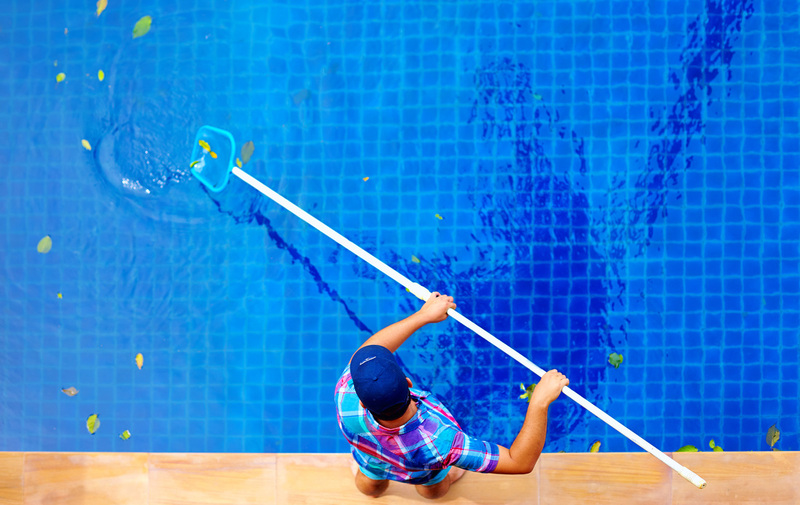 Most of our pool cleaning supplies connect to, so having one available helps our technicians out. If you don’t have one, we will bring one for you. We always make sure it’s free of dirt and other debris. We also come prepared with a leaf skimmer because it’s essential for keeping your pool clean. It’s a small little net that attaches to the teloscipic pool. We use this little net to capture leaves from the top of your pool. Our leaf skimmers are always cleaned out before usage on your pool. We also bring our handy pool brush. The pool bursh is used to clean the sides and steps. We also make sure that our pool brushed are clean before usage, because they tend to get dirty from time to time. Our technicians will skim the top of your pool with our leaf skimmer. Ideally, this should actually be done on a more than once a week basis. We attach our leaf skimmer to the telescopic pole and begin to fish out leaves and debris. It’s not uncommon for pools to have leaves in them (not just from your trees, but the pesky neighbor). Then we tidy up the steps and sides of the pool with our pool brush. After all the leaves are taken out, we go and brush out the ladders as well. This is a step that can be done on a weekly basis. We use our muscles here and really scrub (if need be) all the dirt away. Step #2: Vacuum the bottom with a Commercial Pool Vacuum. Our pool vacuum is an automatic cleaner used to clean the hard to get areas of your pool. We only use the most efficient commercial grade pool vacuum, so you’ll be getting the most bang for your buck. Our vacuum works just about the same as vacuuming a carpet. It moves to and from each side to the bottom of the pool, spinning and sweeping and cleaning the hard to get areas. It’s not uncommon for a ton of debris to builds on the bottom of your pool, and our commercial pool vacuum will take care of business. First, we’ll test the water's pH levels. Depending on its reading, we’ll adjust certain chemical levels. There are particular chemicals (and balances of them) that help keep your pool clean. We also take into consideration the season/ time of year and amount of evaporation expected and make sure we kill off bad, harmful bacteria while still keeping the pool safe and swimmable. Our technicians will then check the pool filter. This should be free of debris, leaves and grime. If there’s anything there, we’ll remove it. We’ll keep your water running fluidly throughout your pool and let you know what we did every time we stopped at your residence. You can’t go wrong with trusting Pool Service Fresno Ca to meet all of your pool service needs with our turn-key services!